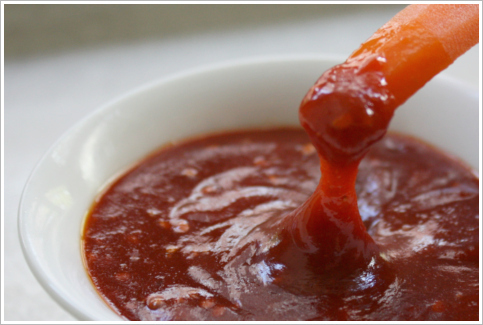 Gochujang, directly translated from Korean, means hot chili pepper paste/sauce. “Gochu” means hot chili pepper. And “jang” means paste or sauce. It is the condiment of choice in Korea. Gochujang can be served with crudités, sashimi, ssam (“wrap”), bibimgooksoo (“mixed noodles”), bibimbap (“mixed rice”), etc. It is also a commonly used ingredient in marinades and soups when preparing Korean dishes. Traditionally, gochujang was made at home and fermented in an earthen pot. But with the wide availability of commercially produced gochujang, you don’t see much of the homemade stuff anymore. I must say though, my maternal grandmother still makes her own gochujang. AND she make it with chili peppers HARVESTED FROM HER OWN BACKYARD. It’s good stuff. When she gives us a jar of her homemade goods, it’s a real treat. Gotta love my grammy. 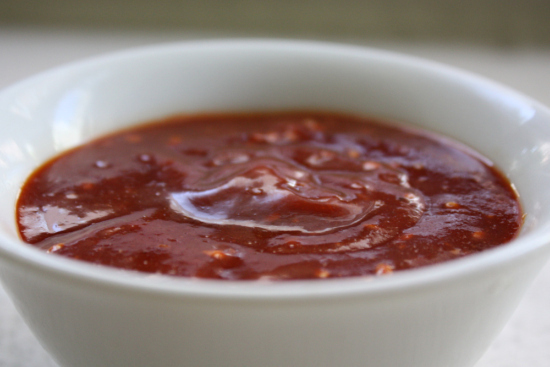 There are many ways to prepare gochujang as a dipping sauce/condiment. Splash some vinegar in it and serve it with sashimi. Add some duenjang (“soybean paste”) and serve it with ssam. Add something creamy like mayo or avocado to make it mellow and serve it with chips or crudités. Possibilities are endless. It all depends on your preference. Version below is probably the most basic. You can use it as a dipping sauce/dressing or sauce for bibimbap or bibimgooksoo. Gochujang is savory, salty, and sweet all at the same time. But it can be very spicy. So tasters beware! Enjoy it with … just about anything! * Gochujang is readily available in Korean markets. I am using vegan gochujang made with glutinous rice. Grains used in the making of gochujang vary depending on the manufacturer. Some use glutinous rice, while others use wheat and/or barley. Some brands also use MSG and fish extracts. So, if you are trying to avoid certain ingredients or you are a stickler for all natural or vegan products, check the label.